In order to facilitate better communication and success for immigrant students in Alberta schools, this guide was developed by members of the Karen community and teachers from Edmonton Catholic and Edmonton Public schools. The Edmonton Mennonite Centre for Newcomers supported the work by assisting the Karen community and providing workspace and professional support for the meetings. This is the third resource in a series developed by the Canadian Multicultural Education Foundation (CMEF) and the Alberta Teachers’ Association (ATA). The first two, which explore working with students from Somalia and the South Sudan, are available from the ATA and CMEF. Lynn Farrugia is a teacher with the Edmonton Public School Board. Renato Delcioppo is a teacher with Edmonton Catholic School District. Lah May Wah was a Grade 12 student at the time this document was written. Lei Thoo represents the community at national meetings. Hse Nay Paw works at a school as a lunch supervisor. Ku Ku is a translator and was a teacher in refugee camps in Thailand. Ariela Cerna and Matt Hundert of the Mennonite Centre for Newcomers in Edmonton assisted with the meetings. 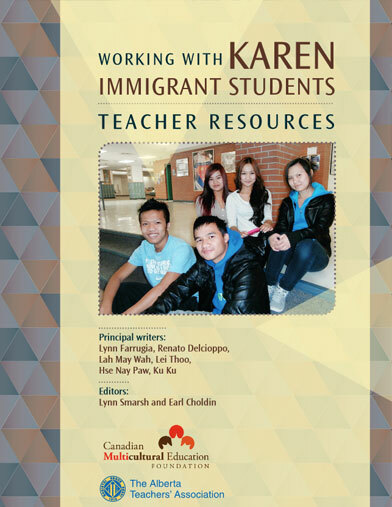 This document was developed by Alberta teachers to assist classroom teachers and school administrators throughout Alberta to better understand the culture and needs of Karen immigrant students in their schools. Comments and suggestions from readers and users will be appreciated. Please send them to: Earl Choldin. Karen is the name given by the British to the group of people who lived in Burma and called themselves, Pwyar ka Nyaw. Pwyar ka Nyaw is also the name of their language. In the 1970s many Karen people were driven out of Burma and into Thailand. Because of the Karen allegiance to the Allies in World War II, while most Burmese supported the Japanese during that conflict, the Karen people were exiled from Burma. Currently tens of thousands of Karen people live in nine UN refugee camps in Thailand. Conditions in the camps are restrictive, with limited educational and employment opportunities, and refugees are not permitted to work outside the camps. Since 2006, the government of Thailand and the UN High Commission on Refugees have been relocating the Karen to communities around the world. There are Karen people now living in Australia, Europe, the US and throughout Canada. The Karen community has a flag, a history, a language and a culture, but it does not have a country to return to. The Karen began to immigrate to Canada in 2006. They can be found living in various communities across the country, including Saint John, PEI, Toronto, Hamilton, Windsor, London, Thunder Bay, Saskatoon, Regina, Calgary, Lacombe, Edmonton, Surrey and Langley. Edmonton and Calgary are each home to about 400 families. Every three years, the Karen Committee of Canada meets in a different city to discuss issues of concern to the community. Most Karen children currently in junior high and high school were born in the camps in Thailand. Elementary-aged children are a mix of those born in Canada and those born in the camps. American missionaries visited the Karen area of Burma in the early 1800s, converting many Karen to Presbyterian and Baptist Christianity. Most Karen in Alberta are Christian, but a few are Buddhist and Animist. Animism is a world view that plants, inanimate objects and natural phenomena possess souls. The church is important in the life of Karen families. Presbyterian and Baptist churches in Edmonton have Karen ministers and offer a blend Karen and Western traditions. This is evident in wedding celebrations, where the women sing traditional songs as the wedding party enters the church, while the youth play new songs using nontraditional instruments such as guitars and drums as part of the ceremony. Children are highly valued and are an integral part of church life. They are typically involved in the music and the social justice ministries within their church. In Burma, schooling was expensive and tuition was high. Schools offered Grades 1–12, but not all children were able to attend school because of the expense and because schools were not accessible to those living in the hilly regions of Burma. In the refugee camps in Thailand, schooling was free, with subjects covered including some social studies, math, science, Karen, Burmese, English and art. Camp schools offered Grades 1–12 from 8 am to 3 pm. The teachers were from the Karen community as well as from other parts of the world. Those from outside brought new perspectives to the schools and the community. Parents trust the teachers as the school authority figures, and they trust the schools because education is valued in their communities. In general, parents feel very positive about the schools their children attend, and they understand age-appropriate placement. Most parents regularly attend parent-teacher conferences and other school events. They feel comfortable calling the school and talking to the teachers about questions and concerns. In fact, many Karen parents prefer to talk to teachers on the phone or in person rather than through notes. Parents have access to online report cards but appreciate hard copies as well. The Karen community values jobs in the trades, such as cabinet-makers and electricians, as well as work in construction and agriculture. For young women, training in nursing, cosmetology and couture is prized. They are anxious that their youth stay in school to gain entry into these careers. Young men and women marry early, and married people do not attend school with unmarried teens. The high school teachers working on this resource noted that students were leaving school after they turned 18 but before they were able to complete their high school diploma requirements. Pwyar ka Nyaw (the Karen language) is written in Burmese script, but it is related to Mongolian, not to Burmese. At present the Edmonton Public Library has no books in Burmese or in Pwyar ka Nyaw. The Edmonton Public School Board has translations in Pwyar ka Nyaw of critical communications such as school interviews and field trips as well as an introduction to School Zone (its online communication tool). It also has books in the Karen language that were ordered from Asia. Students prefer to speak English with their friends but speak Pwyar ka Nyaw at home and with elders. The community is worried that the language may be lost, so in Edmonton, children are taught Pwyar ka Nyaw in Sunday school, and there are plans to establish an extensive Saturday school so students will acquire communication skills in both English and Pwyar ka Nyaw. Regarding English, many children and parents find that Canadian teachers speak English very quickly. Also many words in English have multiple meanings, which makes the language even more challenging to learn. Karen families are usually large and intergenerational, with grandparents and extended family living together. Since leaving the camps, however, families have dispersed throughout the world. Many members of the committee who worked on this project have several siblings in other parts of the world as well as in Edmonton and Thailand. At celebrations it is evident that elders have a valuable place in the culture as the keepers of the lore and traditions. Young people work together so that the celebrations honour everyone. Young adults live with their parents until they marry. When families have extra room, they take in cousins so that no one is alone. The Karen people are beginning to sponsor their family members for immigration through Citizenship and Immigration Canada. The financial strain created by doing this is mitigated by their churches and by fundraisers. Traditionally, Karen women stayed home to care for the children. However, in Canada both Karen men and women have jobs and both take care of the children and perform household chores. Generally both parents are responsible for the disciplining of the children. Older siblings and grandparents may also handle discipline issues. When discipline is required, parents want to know all the information before delivering the consequences. Punishments include taking away video games and having children sit quietly, but not hitting the children. Older children are expected to do chores, depending on their age. The older they are, the more responsibilities they have. They might cook, clean and help out as needed. When children are able to understand, they are given jobs and chores that require more responsibility, such as shoveling snow and babysitting. Chores for children are somewhat gender specific—washing dishes for girls, mowing the lawn for boys. Many children act as translators for their parents. This role reversal is disconcerting for both parents and children and can be a source of friction in the family. The Karen community has organized a group of translators that the community can access throughout Alberta. These people help out at school conferences and with medical appointments. Since coming to Alberta, the Karen community has created new support systems through extended family and friends. They can also turn to their counselors at agencies like Catholic Social Services, Multicultural Health Brokers or their church. Multicultural Health Brokers is an Edmonton group whose members include agencies that serve the immigrant community in the city. They meet, liaise and work together to provide wraparound services for people at risk. Similar groups are found in other urban centres in Alberta. During their first years in Canada, the Karen experienced serious health problems, such as malaria, hepatitis B, asthma and tuberculosis. Now, seven years later, most of the community is healthy; however, high blood pressure, strokes, kidney disease and diabetes are becoming more common among the older people in the community. In the camps, some children developed asthma and malaria, and many children chewed tobacco, which caused further health complications. Here in Canada, children catch the common childhood communicable diseases, especially chicken pox. They tend to have more weather-related health problems, such as asthma. It is rare that the children have food allergies. Children are not typically taken for regular check-ups. Dental and eye exams were done upon arrival in Canada but not since then for some families. Only some parents know that those check-ups are common practice, and others are working and don’t have the time. Children are taken to drop-in clinics if very ill. Parents give children over-the-counter medications for colds and pain. Typically, Karen families eat three meals a day. In the Karen diet, rice is the most common food, followed by noodles. The community eats all types of fruits, vegetables and meat, including chicken, beef, pork and fish. The most popular fruits and vegetables are banana, pineapple, watermelon, sweet potatoes and sugar cane. Most people can digest milk. They like spicy food, although some believe eating it leads to high blood pressure. Eighty percent of the community rents accommodation. Rental units are crowded, but the Karen do not consider this a problem. Typically two small families or a family and a related single person may live together. Constantly rising rents are a burden for Karen families. Those families in subsidized Capital Region Housing feel they are in a better housing situation because Capital Region Housing has stable rent linked to income. As the community is able to afford houses, they are buying them near the rental units they used to occupy to remain connected to the community. The availability of rental units in smaller centres in Alberta may spur movement out of the major cities. This guide includes a short list of resources (page 36) relating to the immigration of the Karen community to Canada as well as a section on Karen Culture (page 3 and page 15). Karen people take the education of their children very seriously, and they trust teachers and school authorities. As well, teachers may not have background knowledge about the circumstances of the family. If the student was born in a refugee camp in Thailand, there may be a lack of documentation and health issues that the school should be aware of. If the student was born in Canada, the issues are different and may be related to poverty. Homework expectations, evaluation systems, school system structure, teaching styles and home support expectations in Canada may be very different than what the parents experienced in their own schooling. This booklet provides a parents’ guide to Canadian schools in the Karen language. While many Karen young people are now able to read and speak English, teachers still face communication barriers with parents. It is helpful to ask parents to bring a translator with them for teacher-parent interviews. Karen parents do not understand the student-led interviews that are increasingly being used in elementary schools. It is helpful to have a translator that the family trusts in this case. There are similar problems with written communication that is sent home. The Karen language is written in Burmese script. In Edmonton Public schools, for example, only very important letters for family are printed in Karen. Teachers need to check with the family about their ability to read English, and if there is a problem, ask for assistance from the liaison workers at agencies such as the Edmonton Mennonite Centre for Newcomers. Parents may need support, especially through their children’s teen years as the students and parents struggle with being between two cultures. Within the Karen community, there are strong family bonds and a desire to keep the language and the culture strong and vibrant. Parents want students to stay in school and complete their education. However, some parents are not aware of career options and the support available for students to graduate and attend post-secondary institutions. Some students drop out to help support the family and repay transportation loans. Also, early marriage may be a family stressor. It is the tradition that married people do not attend the same school as unmarried students. It is an area of concern for schools when students leave suddenly without completing their diploma requirements. The Karen community does not yet have an awareness or understanding of mental health issues such as depression or post-traumatic stress disorder. The stresses related to hiding from danger and then living in camps and under constant threat can wreak havoc with the mental health of some refugees and their children. Schools should have information available about mental health services in the area. Teachers will be most effective by approaching Karen students positively. Karen students need to understand how much they are improving. They want to know what they need to improve on in order to move to the next level, and they need to feel confident that they will move up when they are ready. Parents told us that we should not make assumptions about students understanding a mistake or our expectations. They said that we should be specific about what the students need to improve.Schools will be more successful with Karen students if there are aides in the classroom and community liaison workers or settlement workers that students and parents can talk to. Parent involvement will also promote student success. Parents need to know and be concerned about how well their children are doing in school—they need to be involved in their education and not just be spectators. They need to come to parent-teacher conferences and phone the teacher for an appointment to see how their children can improve their performance. To ensure students have the tools needed for success, discuss what works well in school for students that have grown up in Canada, as well as what works well for other immigrant students. This will include note-taking, test-taking, homework habits and organizational and study skills. Discuss the kind of problems they can foresee and provide examples of successful solutions in a positive light. This discussion can take an hour or longer and must be visual as well as verbal. Try to be aware when a student might leave the education system or is having trouble and then quickly deal with the situation by talking to the student as well as the parents.In conclusion, through dialogue with the Karen students at the beginning of a school year as well as throughout the year, we can help them stay focused on what they need to do in order to be successful in the education system. The outline below may be useful for your beginning-of-the-year session with your Karen students. Do your homework when assigned and do it to the best of your ability. Be sure you understand what the teacher expects from you; if you are not sure, ask. Complete assignments as soon as possible and don’t wait till the last minute. Set aside a certain time in the day every day and a certain place in the house for doing your homework. Review your notes and lessons daily. School is not a 9 to 3 job only. You need to do extra work at home that is not assigned homework. Use your study time to look up words, and use the Internet to get information so that you understand the topic more thoroughly. It is not enough just to read the information. You need to understand it and know it. Talk to your parents about the lesson topic in Karen. When you translate it into Karen, you will deepen your understanding of the topic. Ask questions when you don’t understand the material when it is taught. Do this right after the lesson is taught. Ask questions while you are working on the topic assignment. When an exam is being held in a few days, you must study for longer periods of time. You may find exams hard in Alberta because in Alberta exams not only check your memory, but also your ability to apply the lessons to new situations.Note to teacher: This type of exam writing can be specifically taught. You need to have binders for your notes and work. Organize your binders by subject and date and topic; don’t just stuff your assignments in your textbook. Take your own notes when the teacher is lecturing; don’t depend solely on the notes given to you. Note to teacher: Karen children are paying attention when their arms are folded in front of them. In the Karen culture this shows respect. Organize the lesson so that students have an opportunity to write notes. Don’t assume that all students will write notes while you are speaking. Assist the students in organizing their notes in binders with dates on pages and headings. Developing this skill in junior high will assist students as they move through to high school. Proper nutrition is important for successful learning. Most students eat breakfast, but you must also have lunch so that you are able to learn in the afternoon. Note to teachers: During our discussions we found that parents would prefer that the students eat Karen cuisine, but most youth do not like to eat lunches from home because they are perceived to be different. Many youth want to buy convenience foods for lunch, which expensive and often unhealthy. If school staff would encourage students to bring their own food, parents would be happier. In order to learn English you need to speak English. While in school—in class and out of class— speak English with your Karen friends and make friends outside of your community. At home continue to speak Karen. Speak with your elders about school in Karen. Canada will provide you with many opportunities later in life. You will need English; you will need a high school diploma; and you will need postsecondary training. Begin thinking about your career now. Try to meet somebody in a career you are interested in and learn more about it. What do people actually do day-in and day-out in that career? Would I enjoy it? Do I have the aptitude for it? How would I prepare myself for that career? What education is needed? At some time you may be tempted to drop out of school to take a full-time job. You and your family will want the money you can make when you are 17 or 18. But keep in mind that to make your full potential income, you will need a high school diploma and postsecondary training. By Lei Thoo, Ku Ku and Hse Nay Paw in Discussion with Renato Delcioppo, Lynn Farrugia and Lynn SmarshThe following is a list of some common Karen customs and taboos. A child may not touch an adult on the head. Older people may call others by name, but younger people refer to older people by their position in the family or the community, for example, “Honoured Father”. Children call their teacher “Teacher” out of respect and do not say the teacher’s name. Out of respect, a younger person does not make eye contact with an older person. When listening, children and adults sit with their arms folded. This is a sign of respect, not a defiant gesture. There is a misconception that Karen people have only first names. When registering the Karen in the camps, the UNHCR (United Nations High Commission for Refugees) did not ask for full names. As a consequence, incorrect names have been perpetuated because of mistakes made on camp documentation. Teachers need to ask Karen children how they prefer to be addressed. Karen culture is conservative and Karen teens are often shy, so they do not usually attend school dances. However, boys and girls may work together on school projects. Knives are not to be given as gifts. Birthdays have only recently started to be acknowledged. Karen students participate in Christmas celebrations and other religious celebrations. Most Karen people are Christian. Matt: Are there traditional female and male roles? Girls clean the house and cook for their father and brothers. These chores are done when they wake up in the morning or in the evening. Their brothers do not have to do this. Their mom expects the boys to clean, but they don’t. To make up for this, the girls ask their brothers not to make a mess or cause problems and to stay clean. In refugee camp schools, girls and boys sat separately in the classroom. Both teachers and students wore uniforms. In Canada everyone can sit together and only a few schools require uniforms. Matt: Dating and friendship with boys is an important issue. Lah May Wah and Ka Shee Ha: The way we live is about how adults view us, too. We are very conscious of how adults in the community, not only our parents, interpret our behaviour and social interactions. Boys get a similar, but less forceful, message about appropriate behavior and are treated more leniently. “Guys can go out in the daytime or nighttime, but girls can’t. If we go out, we get a lecture when we get home.” Both boys and girls will be questioned if they are out after dark. Matt: How are children disciplined? By whom? When? Both said they “wonder why you can’t hit kids here.” We talked a little bit about the purpose of the laws protecting children. However, they said that in general, in the Karen community, parents “only hit when it’s the right time. They have control. Besides, our parents’ generation was treated worse.”If a youth has an issue with a teacher, parents will lecture them about it. However, parents expect their children to solve their own problems at school, because they can speak English better and have a greater understanding of the school system. Matt: What is expected of children? When? In the refugee camps, there were high academic expectations. Children had to learn three languages (Karen, Burmese and English) starting at Grade 1. “Once Karen people come here, they change so much. They have freedom. Parents are tired from working, but they want their children to be successful and not have a hard life. Parents expect you to get a good job.” They will give examples of other immigrant communities that have been successful, such as the Chinese community, and encourage their children to emulate this success. However, none of the Karen community members who moved to North America under the resettlement program have graduated from university yet. Matt: How do you feel about leaving school early? Note: The Orientation Guide to Canadian Schools for Karen Studentsincludes a font for the Karen Pwyar ka Nyaw language that is not supported in Western internet browsers. Therefore, a copy of the Orientation Guide to Canadian Schools for Karen Students in PDF format can be opened by clicking here. This guide was originally developed for the second booklet in this series: Working with South Sudanese Immigrant Students –Teacher Resources, written by Athieng Riak, Abiel Kon, Maryanne MacDonald, Elaine Lou and Lynn Smarsh. Karen parents working on this resource were so impressed with it that they asked that it be translated into Karen and included in this resource booklet as well. One of the writers, Ku Ku, translated the guide, and Gay Poe Hai transcribed the script for printing. Karen parents may take the resource to parent-teacher interviews as an aide. This is just one tool to assist schools and Karen families in better understanding and communicating with each other. Consider having this guide available when the student initially comes to register at the school. It may be housed in the general office or in the student services area. District intake centres should also have copies since parents will usually be accompanied by a settlement worker or interpreter when they visit that centre. The various points in the guide should be discussed collaboratively, and parents and their children should have the opportunity to ask questions. Parents should receive a copy to take home for future reference. Remember to involve members of the cultural community in the guide’s creation. Use plain language. This means avoiding educational jargon, explaining abbreviations and using short sentences and the active voice. Use appropriate illustrations to further explain each point. Compiled by Lynn FarrugiaBarron S, A J Allot, K Ewers, E Larkin, J Okell, A Swain, K VanBik and S M Yin. 2007. Refugees from Burma, Their Backgrounds and Refugee Experiences. Washington, DC: Center for Applied Linguistics. Also available online. (accessed August 13, 2014) This is a multifaceted monograph of the Karen refugee experience in the US. Cummins, J. 2001. Bilingual Children’s Mother Tongue: RWhy Is It Important for Education? Sprogforum 7, no 19 (February): 15–20. An article from Professor Cummins of the University of Toronto encouraging the continuing development of a child’s first language to support the development of the child’s learning of English. Hill, J D, and K M Flynn. 2006. Classroom Instruction That Works with English Language Learners. 1st ed. Alexandria, VA: ASCD. How Can a Boy. 2012. Produced and written by Jane Gurr. Documentary. Ottawa: Kublacom Pictures. Additional information on the film may be obtained by emailing the producer. If the film cannot be accessed, the trailer is worth watching online. Neiman, A, E Soh and P Sutan. 2008. Karen Cultural Profile. EthnoMED website. (accessed October 12, 2014). This monograph gives a view of life in Burma and in the Thai camps, with a specific focus on health issues. It came from a round-table discussion with the Karen community in Seattle and Minnesota. Smeaton, D M. 1887. The Loyal Karens of Burma. London: Kegan Paul, Trench & Company. This book traces the history of the Karen people, describes their life in Burma and recounts some cultural tales and their contact with Christian beliefs. The Karen people: culture, faith and history, Published by the Karen Buddhist Dhamma Dhutta Foundation © 2010, 2011 (accessed October 12, 2014) Available online.